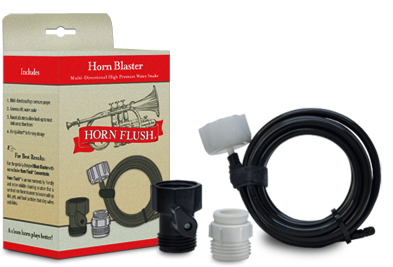 Blast away dirt and grime from the inside of your brass instrument like never before with the Horn Blaster! This exclusive Multi-Directional High Pressure Sprayer blasts dirt and grime using 5 independent jets. The convenient on/off valve helps regulate the water pressure and temperature for a deep clean flush. The generous 6ft. water snake is long enough to reach inside almost any brass instrument. VELCRO® is a registered trademark of Velcor Industries B.V.